After finding tremendous success with their biopics on Full House, Saved by the Bell and Britney Spears, Lifetime is bring A Tale of Two Coreys to small screens everywhere in 2018. The biopic will follow the infamous and tumultuous childhoods of 80s superstars Corey Haim and Corey Feldman, two actors who shared a first name and a special bond after first appearing together in the classic 1987 vampire movie The Lost Boys. Corey Feldman is helping to oversee the project, and has given his insight into some of the shadier things that went down on various movie sets and at parties attended to by Haim and Feldman. It will also look at their drug addictions, and personal struggles with abuse both physical and sexual. A number of different actors have been cast as the two former teen heartthrobs. Elijah Marcano is playing the teenage Corey Feldman, with Scott Bosely playing him as an adult. Justin Ellings will play the younger Corey Haim, with Casey Leach portraying the troubled youth in his adult years. The pair became best friends at a young age, and weathered various highs and lows in the world of Hollywood moviemaking. The pair starred in a number of movies together that include the previously mentioned Lost Boys, as well as License to Drive and Dream a Little Dream. Though they decided to work alone heading into the 90s, they would reunite for a number of low budget, straight to video movies that proved to be, for the most part, somewhat embarrassing. The pair would reunite once again in 2004 for the short-lived reality series The Two Coreys, which lasted two seasons due to Haim's erratic behavior at the time. A third season was supposed to happen. But Haim ultimately passed away. In a recent chat with Yahoo about his time spent on the set of The Lost Boys, Corey Feldman was asked about working with Corey Haim. He declined to comment, reiterating that he made a deal with Haim's mom not to talk about the late actor in public. That's when he offered some insight into the upcoming Lifetime movie, which will debut sometime in 2018. "This is why my hands are tied. We actually have a Lifetime movie coming out that is about the two Coreys. Which I helped produce. To help lend some stuff to the story as well. I wouldn't say I'm the writer or director. It was done with some friends of mine. And I helped with some stuff so that it didn't stray too far from the truth. That is coming out, and I have given my commitment and my word to Corey's mother that I steer away from conversations that are about him." Corey has had quite a hand in the production of the movie. Which hasn't been the case for most of the recent Lifetime biopics focused on 80s pop culture. 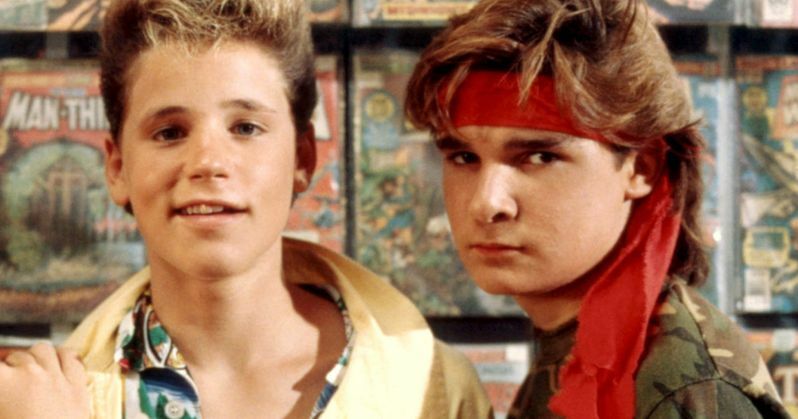 A synopsis for the movie claims that the story will take place 6 years after the death of Corey Haim, as Feldman reminisces about their friendship, their jet-propelled rise to sudden fame and the tragic fall that followed: a drug-fueled descent into addiction, rehab and adulthood. Feldman goes onto say this about the movie. "It's a biopic. It's not straightforward, I didn't personally write it. But I had a hand in it. I wasn't personally available, I wasn't on the set. It was right when I was launching my tour when it was starting production. I can tell you that the kids chosen to play us are great kids. They are really great actors. And they really hit it on the mark. I think fans all over are going to be enamored to see these two kids. That said, I haven't seen the whole thing finished. I don't know how it turned out. It isn't coming out until next year. I do know it's in the editing room." Feldman goes onto confirm that Carrie Fisher will be featured in the movie, with Jennifer Peo playing the late actress. Fisher and Feldman worked together on The Burbs. Feldman says this about the role Carrie Fisher played in his life and how she centers in the movie. "Her and Joe [Dante] sat me down and had a very serious talk with me. Because at the time I was headed over the edge. I was right there. They could see it. She is a very smart lady, and she was sober at the time. She looked me in the eyes, and said, 'Let's be serious. I can see what you're doing. Just be honest with yourself.' And I was like, 'I am fine!' Granted, I was smoking weed in my trailer at the time, and they smelled the weed, and that came with all kinds of other assumptions that stuff was going on. I was hanging out with Sam Kinison, and he had a bad reputation for being a Coke head. So, I was doing Coke with him. But I had gotten over that bump. And I didn't want to do that anymore. I was kind of getting back to my sobers roots. And then that's when I went off the deep end. Because of a girl. I got my heart broken. She cheated on me. I went to my influences and asked how do I fix this, and that brought me to the next level of drugs. Which brought me around. And before I got sober. Point being, this was right before I took that plunge into depravity. And I think Carrie saw something in my eyes. She knew that this was not going to end well if I kept going down this route. And she was right. A year later I was hooked on heroine. I got busted, and it was all over the news. She certainly saw it coming. That was a huge thrill for me to be associated with her. I loved Star Wars. All I ever wanted was to be in a Star Wars movie." Also in the movie are Michael Jackson, played by Brandon Howard, Burbs director Joe Dante, played by Claude Knowlton, Tom Hanks, played by Brian Nolan, Lost Boys director Joel Schumacher played by Jay Disney, and various members of The Goonies cast, with Drew Shapiro announced as Kerri Green. No release date is set yet, but the movie should arrive in the first quarter of 2018.